Update on EmBraced In Comfort! Well, it’s been a while since I did a blog update on my business side of things, but since many of my readers also enjoy the comfort that our undergarments bring, I thought it would be nice to do a little update. First of all, these past few months have been very busy with our daughter’s surgery, but I managed to launch an entirely NEW and improved website. You can visit our new website at: www.EmbracedInComfort.com. I am very excited about this new website because it has a lot more functionality on my end of things, but also because it has a nice, new look and we now offer our customers the option to pay directly on the site with Visa, Mastercard, and Discover, in addition to PayPal. Yay! We have also launched our brand new Bamboo Blend fabric. Our new fabric is a blend of Bamboo, Organic Cotton, and Spandex. Bamboo is naturally antimicrobial, naturally wicking to control moisture from sweat, and is grown in sustainable, organic ways. A big win. The new fabric feels softer than ever, while still having the same weight and stretch characteristics of our Organic Cotton/Spandex blend. In fact, the fabric is so soft to the touch that my daughter had all of her friends gathered around at school, feeling the tank top I we had made for her to wear under her shirt at school. They were “ooing and aahing” 🙂 We still offer the Organic Cotton/Spandex blend in black and lavender (while supplies last), and have a little bit of white left. Also, we launched our new “Clearance” Section, where customers can get great quality items in their size that may have one or two small defects or changes. We try to sell only first quality, excellent items, so anything with a blemish goes into the Clearance section. We have all new professional photos of our Bamboo Blend products as well. Soon, we hope to get more videos uploaded, so I will keep you posted on that. We appreciate all of the support from our readers and make it our mission to embrace every person in a brace with as much comfort as we can, at an affordable price. Check it out! Today my daughter and i traveled the two hours (one way) on snow-covered roads to her Doctor for her 8 week post-surgery checkup. By now, the routine is very familiar. Arrive, x-rays, Office visit with Resident, office visit with Doctor. Somewhere along the line, the routine took over and now it seems there is no fear and trembling as in visits of the past. I remember early on how I couldn’t sleep for days before a visit – just worrying “Will the curves be worse?” “Will this be the day that she says we need surgery?” All of that seems so far behind us now. I was actually not nervous. At all. And, it turns out the results were wonderful and joyous, yet mundane at the same time. We are finally happy to be in the mundane! She is, of course, doing just great! She is recovering on schedule and with very few problems. She has some knotted muscles on her upper left shoulder, but the Doctor just suggested I work on those by massaging her at home. she also said that our daughter can increase activity – she can now swim (still no bending or twisting) and dribble and shoot a basketball (very important). Still no running, bending, twisting, or more than 10 pounds lifted, but she is definitely making progress. And, the Doctor also said that, contrary to what we talked about before surgery, she does NOT feel that we should consider bracing our daughter post surgery. Our concern has been her lower curve (which is not fused), but the lower curve is looking stable and she does not feel it will move much as our daughter finishes growing. Also, when she was performing the surgery, the Doctor found that the upper vertebrae were actually weak, which she said COULD be a result of so many years of bracing. The Doctor looked at our daughter and said “You’ve been bracing most of your life! Won’t it be nice to not have to worry about that?” And, our daughter responded with a beaming smile. She wore a variety of braces for about half of her life so far and she never complained – she took it on as a champ and did everything she was told. And, she would do it again if she had to. But, she was definitely, clearly relieved to not have to deal with that part of Scoliosis anymore. And, I am kind of relieved to have a break from it, too, as our son’s curves have been lowered and stabilized due to bracing and he can also take a break for a while from the strict regimen. It’s almost as if we feel somewhat … what’s the word? Normal? It amazes me that I started this blog and this journey to do whatever we could to avoid surgery. Surgery was the big unknown, scary beast that I fought daily through research and Doctor’s visits, and at night in my worries and dreams. I don’t recall having any real peace surrounding my children’s health in many years – probably 6. But, today, I felt peaceful about it. God put us on this path a long time ago and has continued to inspire me to do what I can to make the best of it – the proverbial “lemonade out of lemons scenario”. And, then he took us where I never wanted to go – through surgery. And, now he has again brought me to a place in the adventure I never thought I’d be – at peace! Many of you have written me over the years – you’ve been facing the same journey of uncertainty. Let me just reassure you that, if you hold the bars of the roller coaster, and lift your face to the heavenly breeze, you will get through the ups and downs and get back to a place of peace eventually. At least, that is my sincerest prayer for all of you. The journey is definitely NEVER over, but cherish the pockets of peace. Other Moms told me that I would be surprised at how quickly my daughter would recover after surgery, but I have to say that I was skeptical. However, now I can hardly believe it’s been just shy of 7 weeks since surgery. My daughter is nearly back to school full time (she will be Monday, although we have had a LOT of time off for snow and cold days for her to rest). She also had the opportunity to play her clarinet in an area Honors Band last weekend, a privilege she earned before surgery by scoring a blue ribbon in the area solo and ensemble. We didn’t want her to miss a great opportunity to be in a band with all the best and brightest from the area, led by the band conductor voted #1 in the state of Michigan! So, we decided to try it and see how she would do with the nearly 10 hours of sitting and rehearsing. I was one nervous Mom because I had to leave her there – and, she does NOT have a cell phone (the one time I would have liked her to). But, she did a beautiful job, the concert was amazing, and, although she said her “shoulder blades were very sore” afterward, she did just fine and was not sore the next day. I was so happy for her (and so relieved when it was over and I could stop worrying!) Now, this weekend she has to start back to her chores – something she has gladly let me take care of for the last month. 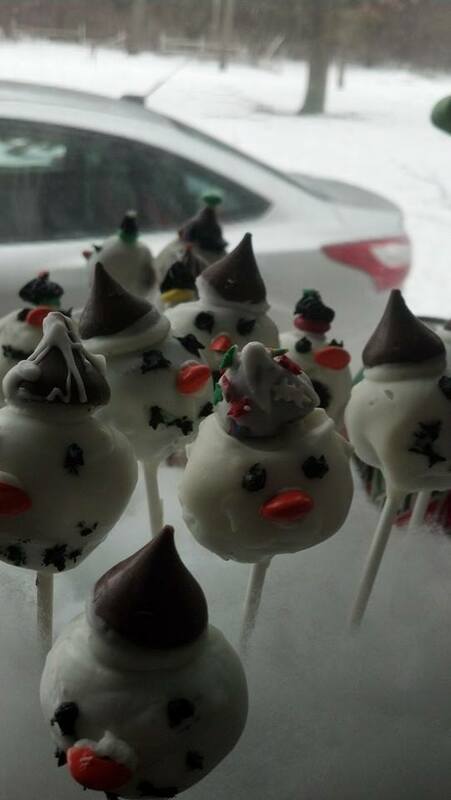 But, anyone who can stand and make 16 detailed cake pops (pictured below) can probably start scooping cat poop out of the litter box (sorry, honey). 🙂 So, for those reading this with fear and worry in their heart concerning an upcoming surgery for you or a loved one, I can say that our experience in recovery has been surprisingly quick, painless, and downright boring – in a good way!